Registration for the 2019 SEMA Show in Las Vegas is now open! And yes, we have details. The SEMA Show is the largest automotive aftermarket trade event in the world. It brings together tens of thousands of manufacturers, suppliers and automotive professionals to browse, learn about and purchase the latest tools and products. It’s also a great place to network, learn new skills, forge business relationships and check out some awesome vehicle builds. The biggest auto shops and brands from across the world will be there. Cost: $40 online / $65 fax or mail, until October 11. After that, prices increase. What to expect: New product showcases, training seminars, business workshops, drifting shows, award-winning vehicle builds, celebrities and more! 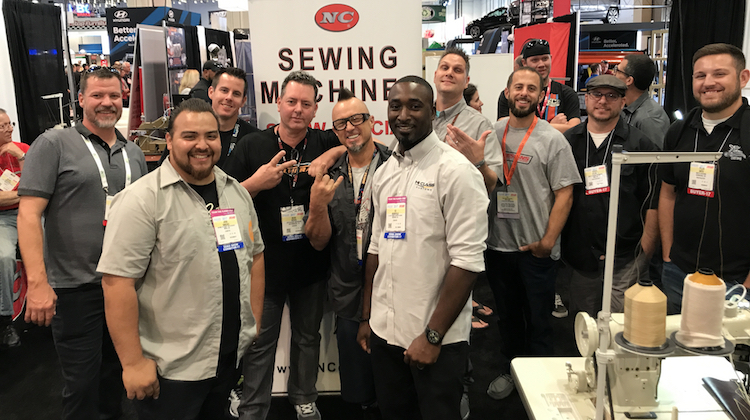 Of course, that’s not all: Last year’s show was a massive success for the auto upholstery industry, thanks to efforts by NC Carpet Binding & Equipment to bring trimmers from across the world together. This year promises to be even bigger, with more prizes going to the winner of the second annual “NC Auto Interior of the Year” award. Don’t miss all the fun! To register for the 2019 SEMA Show, visit SemaShow.com. Why are Headrests Difficult to Remove? Have you ever wondered why some headrests are … [more] about Why are Headrests Difficult to Remove?